This is to let you all now that I’m setting out on a bike ride this Friday May 30th, I will be cycling to Sant Hilari Sacalm in Spain. I will be using this blog to keep my family, friends and others interested up to date about my whereabouts. I’ll be tweeting during the daily bike ride, the tweets will be automatically available on the blog. I have been training for months to prepare myself for the strenuous trip, I have racked up over 2,700 Km on my bike. 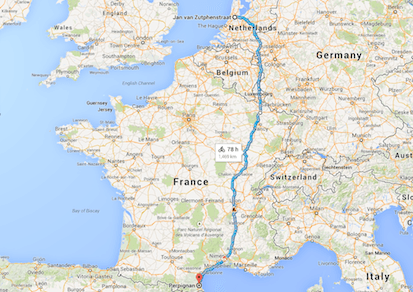 The trip I’m doing to Spain is about 1,500 Km give and take. My route will take me from Amsterdam to Germany near Aachen, from there I go through Belgium and Luxembourg into France, the ride will take me 8 days as I will put in about 10 hours biking a day, which is between 200 to 250 Km a day. I will take a rest day every 4th day, depending on how the body is reacting. Here is a map of the preliminary route.